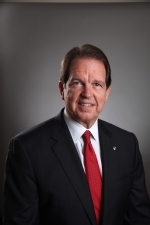 Welcome W. Wilson, Jr., was appointed to the University of Houston System Board of Regents by Governor Rick Perry in 2011 and will serve through August 31, 2017. For fiscal year 2016-2017, he will serve as vice chairman of the UH System Board of Regents, chair of the Facilities, Construction and Master Planning Committee, vice chair of the Finance and Administration Committee, as well as a member of the Executive and Compensation Committee. Wilson is president and chief executive officer of GSL Welcome Group, a real estate development firm specializing in single-tenant office buildings and industrial properties with warehouse and manufacturing facilities. He has extensive experience in industrial development, residential subdividing, office buildings, and retail centers. He also serves as developer with Kingham ∙ Dalton ∙ Wilson Ltd., a Design/Build construction affiliate of GSL and director of River Oaks Financial Group, Inc.
Wilson’s philanthropic endeavors include serving on the board of the Houston Food Bank, where he previously served as vice chairman, and the American Lung Association Regional Advisory Board. He served as director of the Houstonian Club Advisory Board and president of the Kinkaid Alumni Association. Wilson is a native Houstonian and attended the University of Denver.